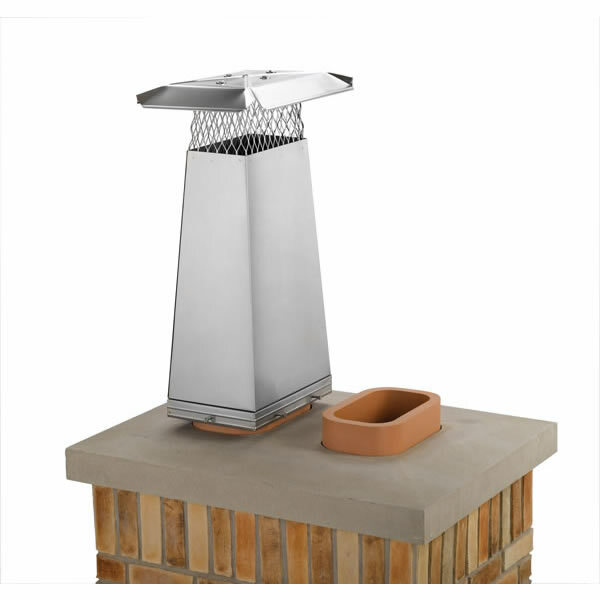 Fits Outside Tile Dimensions: 6-1/2" x 6-1/2" to 8-3/4" x 8-3/4"
This Stainless Steel Flue Stretcher by Gelco, effectively stretches the height of your chimney flue by one foot, which does two things for your chimney termination: it solves negative house pressures that can pull the smoke from a neighboring flue down your flue, and by putting the flue opening above roofs and other nearby structures you will improve your overall draft-reducing downdrafts. This flue stretcher measures 8 in. x 8 in. at the base, and easily tightens to flue tile with screws on all four sides of the base. Should I use a silicon to seal or will the flu draw without air tight seal? Draft is too complicated of an issue to diagnose, so there would be no guarantee of good draft, even if the sealant held any bearing when attempting to improve draft. 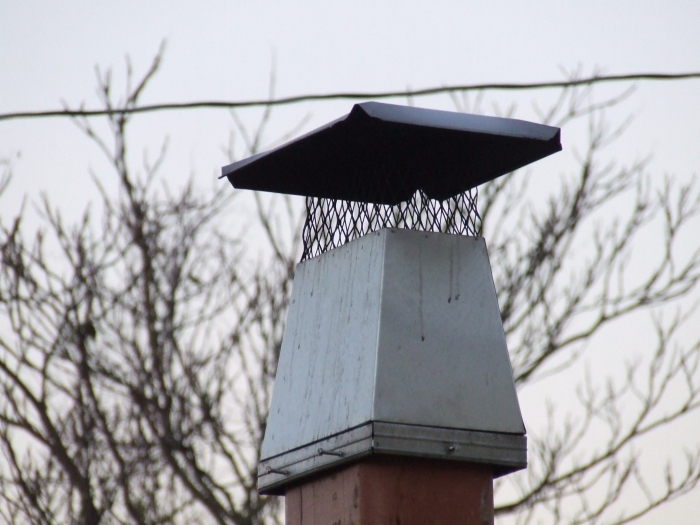 With the cap in question, it is secured to the outer flue tile that commonly extends from the crown surface with masonry chimneys. Items arrived quickly and in good shape. I appreciate your fast response. Everything went well from delivery to installation and it works well!! better than expected. Very heavy stainless, easy to install, fit perfect. I did paint it flat black rustoleum after roughing up surface and applying self ech primer. Mounted easy and quickly. Looks very sturdy. Chimney extender works exactly as advertised. Not a hint of smoke in my other fireplace regardless of temperature, humidity, or wind. ProsEasy to install. Attaches firmly to flue. Heavy duty high quality item, install resolved my problem with woodsmoke being drawn down furnace chimney. Excellent item. This is doing exactly what we wanted it to do. Very well made product. Good quality and pleasing appearance. I would recommend this product to anyone. My fireplace never did draw well and discharged smoke frequently found its way into my basement because it was picked up by my second flue which vented by furnace and water heater. A 34" extension for the fireplace flue immediately solved a problem that vexed us for more than 20 years. ProsSturdily built, well packaged, easy installation, immediate results. Cons..wish it were offered in an easily paintable finish so it could blend with the roof. What can i say right out of the box up on the roof done 10 minutes ,thing is well made should last longer than me. ProsEasy insulation ,tighten bolts done,when thru that eastern wet snow with 40 plus mph wind no problem. I bought this chimney cap to address a rather unusual situation. I have an outdoor fireplace on the covered patio behind my home. Due to some sort of odd low pressure area caused by the nearness of the house, the fireplace smoked badly. I purchased this cap in hopes of getting the smoke high enough to get into the airstream above my home. It definitely helped my problem and mostly resolved it. To completely solve my issue, I added a special fire grate to really push the heat up the chimney. I had no problems installing the chimney cap. Although they seem secure now, I was afraid that the screws might loosen over time. To prevent the cap from blowing away, I added a thick layer of silicone sealant around the base. The silicone doesn't get too hot when the fire is going and will keep the cap secure even if the screws fall out. The cap is very well built and seems quite durable. It was a good solution for my problem.